Christmas markets, also known as Weihnachtmarkt, have a very rich history; beginning in the late 1400s to early 1500s in German speaking areas of Europe as well as locations through out the Holy Roman Empire; including many eastern regions of France and Switzerland. They were usually held in and around main churches in cities, to draw church-goers to them; leading ironically to issues filling pews during services. However, it was not until Martin Luther suggested that the gift exchanges be done in the name of "the Christ child" that the date of Christmas was changed from November 11, which is St Martin's day, or December 6, which is St. Nicholas Day. Changing the name to Christkindlesmarkt, to show the switch to "the Christ child" as the reason for the holiday season. Bringing an element of giving and receiving, to the reformed celebrations of Jesus. These modern street markets are celebrated during the four weeks of Advent, leading up to the reformed date of Christmas. Advent being traditionally known as the preparation time for the coming of Jesus. Many things are done during this time such as: hanging Christmas lights, starting an Advent calendar, and lighting an Advent wreath. Fitting in seamlessly with Christmas markets as a celebration meeting place. Several have live nativities, where locals will dress in their respective costumes and a child will dress up as Jesus; paying further homage to the Messiah. There is little doubt that this was Martin Luther's intent during the reformation period. There are many famous markets still held in Dresden, Augsburg, Erfurt, Stuttgart, Frankfurt and Nuremburg; with Nuremburg and Dresden drawing as many as two-million excited people. Stuttgart and Frankfurt bring in even more people, with upwards of three-million satisfied visitors. Further proving that Christmas festivities have still maintained their expansive and deep roots. As is very popular today, even in the very infancy of these wonderful street markets; many tradesmen sold their wares at these markets. Whether it was decorative Christmas ornaments, small tin figurines, or tasty foods that were special to their own particular areas; they were always very festive and became more mass marketed in their uniqueness, but only from an increased prevalence. Despite beginning in German speaking areas, Christmas markets have spread all over the world. Most still include many well-known popular attractions, such as: carved nutcrackers or nussknacker, the nativity scene, and figurines made of dried fruits called zwetschgenmännle, candied almonds also called Gebrannte Mandeln. Bratwurst, mulled wines offered with or without brandy, softbread cookies, and eirpunsch an egg-based alcoholic drink used to help keep warm in the cold temperature. The Bristol Christmas Market has all of these great things and many more. Located in the Bristol shopping quarter. "Lovely place to spend the day/night with family and friends." remarks Stevie P.
Traditional ornaments and nativity scenes are only the tip of the ice-burg. 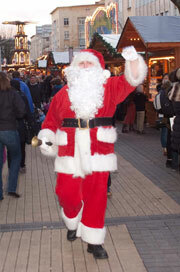 The merge of the Local Christmas market brings another layer of festivity to this market. Handmade gifts, such as candles, jewelry, artist prints, cards, and stained glass are all available for gift giving to that special person. There are also craft beers, local ciders, pastries, artisan cheeses, and many other items for the Christmas table. This market, as well as others, can be considered a mini European cultural hub. Many different cultures take part in spreading their traditional cultural flavors, as the Italian, Murano works does with glass quill pens, venetian carnival masks, collectibles and original jewelry. Another beautiful space is Red Hot Dan's with handmade resin jewelry, black and white prints, and sketches appealing to anyone's gift recipient pleasure. Tiny, individual candle and aroma oil holders, all handmade from Lithuania have Christmas gift written all over them, maybe even for ones own Christmas collection. Another unique items you can find there are anniversary gifts by year from Eternity Rose that are made from real roses and precious metals. Aside from beautiful would-be gifts, there are many live attractions to be seen at the Bristol Christmas market as well. The popular Gaswork choir, whom sing lovely songs while simultaneously raising money for various charities; have been known to pop in once in a while, bringing joy to visitors. For the children there is a cute and quaint galloping carousel, plus games with unique prizes catering to the imagination of everyone. Stalls filled with handmade wooden toys, sure to bring smiles and cheer to any child's face. For everyone of any age, there is food and drink galore as Michelle can attest to "...Drinks were fab as was the food...Thank you Christmas Markets for a lovely evening! "; with such foods as delicious pizzas, not known for being a Christmas delicacy, but tasty nonetheless. "...It was tasty with a good amount of cheese..." says Craig J at bristolpost.co.uk. The two bratwurst stalls smells, set the festive scene, with several different options to fit anyone's needs. Finally, there is the Carvey market with many delectable foods, such as: roast beef rolls, roast beef baguettes, and pigs in a blanket just to name a few. This is in no way a complete list of all the foods available; however it is a deliciously mouthwatering one. There are possibly more desserts than other foods, such churros, sprinkled with yummy cinnamon and sugar courtesy of the Garcia family. Tastefully rich self-baked cakes, muffins, and the famous German Stollen are all available as guilty pleasures. For the imbibing adults there are German beers and luxury Beronia wines, all located in cute stalls with many options including Rosado, Vuira, and Crianza, just to name a few; perfect as gifts for that wine or craft beer lover. The overall atmosphere of the market is nothing short of a Christmas wonderland; beautiful lights and garlands everywhere. Forty-Five wooden chalets, all designed and uniquely executed with ornaments and more lights. Building a festive five-senses texture, that just says "Christmas is coming." The gorgeous Christmas lights twinkling above the crowds, all started with a parade through the Galleries; enhanced by a gospel choir. Leading to the Lights on event, culminating in a Cabot Circus performance like no other. All lending to nothing short of a Christmas pulse that anyone would enjoy.